Brandon Weeden is an American football quarterback, currently playing for the NFL’s Houston Texans. The athlete has definitely made a name for since his professional debut. Prior to playing for the Houston Texans, he played for the Cleveland Browns, The Tennesse Titans, and The Dallas Cowboys. He also played for the Oklahoma State Cowboys while in college. 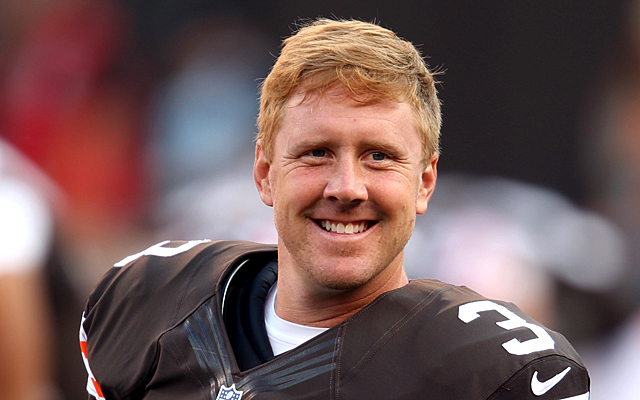 Brandon Kyle Weeden was born on the 14th of October, 1983. He attended Edmond Santa Fe High School, where he was the school’s starting quarterback. At 19, he led his high school team to victory and was awarded team MVP and offensive player of the year. Brandon was originally not into football at first, he was more interested in baseball and was even drafted in the second round of the 2002 Major League Baseball Draft. Between 2002 and 2005, he played for several teams including the New York Yankees, Los Angeles Dodgers, and Kansas City Royals. But in 2006, he played his last season of professional baseball and could not continue due to injuries and a string of poor performances. Brandon moved on to Oklahoma State University in 2007 and didn’t take part in any games for the first year. By 2008, Weeden started playing for the university’s team – the Oklahoma State Cowboys. He was an exceptional player and even led the Cowboys to a comeback victory in November of that year. He kept up the peak performance and by 2012 Fiesta Bowl, Weeden threw for 399 yards and had 4 touchdowns. His accomplished a lot during his college football years including being listed as a 2010 Manning Award Finalist, as well as being the 2010 Player of the Year Award and the 2012 Tostitos Fiesta Bowl Champion. Brandon moved on to professional football after college and he began playing for the Cleveland Browns for 2012 and 2013 seasons. Even though he was much older, Brandon did not allow it to affect his performance. In 2014, he signed a two-year contract with the Dallas Cowboys. Unfortunately, his performance level was low and he was benched for quite a number of games. For the 2015 season, the Houston Texans claimed Weeden off waivers and he was able to lead the team to get its first-ever victory away to Indianapolis. Brandon Weeden presently earns a base salary of $790,000 with a signing bonus of $90,000. The Oklahoma-born quarterback has an estimated net worth of $5 million. It is safe to say the athlete has landed on his feet after a rocky start to his career. Brandon was born into the family of Robbie and Sharie Weeden. He has a younger brother, Tyler Miles Weeden, who is a baseball player. Tyler was drafted by the Boston Red Sox at the 2006 MLB June Amateur Draft. As a teenager, Tyler made the 2007 New York Penn League All-Star Team. Tyler, like his brother – Brandon, was also on the Edmond Santa Fe High School Team. The Weedens currently reside in Edmond, Oklahoma. Brandon is currently building a family of his own with his wife and son. Brandon is very proud of his family as he is seen posting pictures of them on Instagram. On a more personal level, Brandon Weeden is married to Melanie Meuser and they have a son together – Cooper Weeden. With Cooper’s arrival in 2014, Brandon and Melanie became first-time parents. Brandon was notably excited and ready to adapt to the new experience. Melanie and Brandon’s love story started when Melanie was just a freshman at Oklahoma State University. They started dating but sadly broke up after two months together. Four years later, the two met again and picked up their relationship where they left off. The pair got married on the 27th of July, 2009 in Isla Mujeres, Mexico. Melanie was one of those who raised eyebrows when Brandon moved his attention from baseball to football; thankfully, the choice paid off. Before becoming a full-time mom, Melanie has previously worked as an employee relations coordinator for Ocean Dental in Stillwater, Oklahoma from 2009 to 2012. She has also worked as an account manager at Foundation Medical Staffing.